...If you're overseas, bet you didn't know it's Maori Language Week. Learning 'Te reo' is all the rage in the media this week. I quite enjoyed the brief Maori night class I took just after moving here, and one fine day if I ever have the spare time I'd dig taking another. But as a bilingual society here you have a fair amount of Maori filter through into your day-to-day conversation, too. But this week we have had the single finest Maori-English fusion yet introduced. I present to you.... Maori SpongeBob SquarePants! I find the Maori theme song particularly awesome. And a little bit scary. 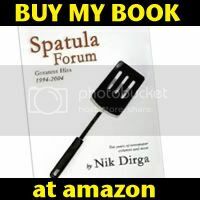 • Also on the Internets – I've been catching up a bit on some writing for BlogCritics lately. You can zip on over there and find a reviews of the re-release of Nick Cave and the Bad Seeds' debut CD, "From Her To Eternity," and a look at the swell new Jayhawks compilation, "Music From The North Country: The Jayhawks Anthology." Go read and be rewarded! So a friend who visited the US recently brought me back a copy of the good ol' San Francisco Chronicle and, when I put it side-by-side with the local product -- well, news sure is shrinking in the US, isn't it? 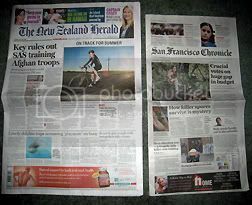 I mean, New Zealand papers are quite big and wide – the first time I saw the Herald I thought it was a bedsheet! 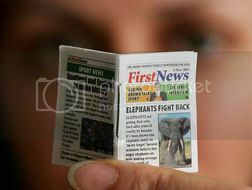 – but US papers have also been shrinking quite a lot in recent years, in order to save paper costs. The Chronicle has diminished quite a bit just in the year or so since I've been in the States – it's like a napkin or something now, and the oddly elongated format isn't as satisfying as a square tabloid might be. I know papers have to cut costs (boy do I ever) and it is good to save the trees, but at some point a newspaper sure starts to look small if it keeps on shrinking, doesn't it? Sign of the times, I guess, but the traditionalist in me sure likes the tactile sense of a newspaper to have a bit of weight to it. Oh well. Could be worse! We mark our lives by odd little milestones. One for me is that I have been pretty consistently buying "Amazing Spider-Man" comics for nearly 30 years now, through thick and thin, red costume and black costume, good stories and dire ones. I bought Peter Parker, Spectacular Spider-Man issues off the spinning comic book rack at Lucky's Drug Store 27 years ago, and I've kept going ever since. Spider-Man is far and above my favorite comics character, probably because of his quintessential everyman qualities. Plus, the guy is funny and has a great vast rogue's gallery of villains. The comic has gone up and down, but I've been there for much of it – and this week, "Amazing Spider-Man" #600 hit the stands. It got me thinking about the previous "milestone" anniversary issues of Spider-Man over the years, and how they played out – hang on tight for a ride through Spider-Man's "100th anniversary" issues from 1971 to now! Amazing Spider-Man #300 (1988) -- We're oh-so-1980s now, with young hot talent Todd McFarlane on the art and the introduction of some character called Venom (foreshadowed in another nifty cliffhanger at the end of #299). Now, years later, we're all well and good and sick of Venom, who was never as interesting a character as they tried to make him in the 1990s with endless spin-offs, miniseries and apperances. But in this first appearance, yeah, he's pretty cool, a black-clad maniac mirror of Spider-Man (at the time he struck me as Spidey's version of the Joker), with McFarlane turning in some impressively ornate, if somewhat unpolished art -- Spider-Man and Venom in action look fantastic, while all the human characters look a bit like plastic dolls. As a story, this is a good done-in-one as Spidey faces off against the seemingly unstoppable Venom. Sure, lots of terribly dull and lame tales came in its Venom-frenzy wake, but don't hold that against it. Rating: Four webs. Amazing Spider-Man #400 (1995) - In which Aunt May dies. No, really! But then it turns out she was a clone. Or an alien, I forget which. Yeah, welcome to comic books. This one came right in the middle of the much-reviled "Clone Saga," and it was actually during one of the rare times I've stopped regularly buying "Amazing Spider-Man" over the years – but this was #400, so heck, I picked it up. It was a dire time for comics, full of gimmicks (witness the hideous "tombstone" cardboard cover). In this comic you've got at least three Spider-Men running about, lots of ponderous villains and hanging plot threads. Yet, oddly, in the midst of all the clutter, writer J.M De Matteis crafts a nicely human, small story about May Parker finally giving in to her fate. It has some lovely character moments between Aunt May and Peter, and a genuinely heartbreaking ending. But... this would've been a much better tale if they didn't erase it from memory a few years later and made it all "never happen." As it is, it just kind of stands as one of the many 1990s oddball turns for Spider-Man as a character, decent at the time but undermined by later editorial tap-dancing. Rating: Three webs. Amazing Spider-Man #500 (2003) - Curiously enough, even though this came out only 6 years ago, I had to re-read it to remember what happened. Not a good sign! Writer J. Michael Straczynski had a long run on Spider-Man for a while there, full of good ideas but also a little too convinced of his stories' own self-importance. Spider-Man is "lost in time," battling through various dark alternative futures, and, much like in #100, facing off against hallucinated re-enactments of all his deadliest battles as he bounces through space and time. It's one of these stories that strives to feel big and epic, yet I have to admit I find it kind of boring – lots of smash and bash, little heart, a feeling that it's a big "coming attraction" for more stories. Even what's meant as a big emotional moment at the coda, a reunion of sorts with Peter Parker's beloved Uncle Ben, falls flat. Also like #100, though, what saves a rather prosaic tale is some fantastic artwork, this time by perhaps the most reliable Spider-Man artist of the last 25 years, John Romita Jr. But as for Straczynski's rather pretentious writing, this one is a bit of a miss. Rating: Two webs. Amazing Spider-Man #600 (2009) -- And now the latest anniversary, 47 (!!!) years after Spider-Man debuted. This big-overstuffed 102-page issue is a lot of fun, particularly the main story which features the return of Doctor Octopus, in a new and eerie fashion. And our old pal John Romita Jr. is back on the art – his figures a little blockier perhaps than they once were, but generally a good effort. I enjoyed the main tale here a good amount, as it mixes big action with a generous dollop of heart and humor (missing in some of these anniversary issues). Cameos galore by heroes like Daredevil, Wolverine and the Human Torch, but they don't feel too gratuitous. Some of the back-up stories here are rather forgettable, but none are actually objectionable. It's too soon to tell if this will be a "classic" anniversary issue, but it definitely continues the good strong solid run "Amazing" has been on the last year or two. And it's nice to have a hefty comic that actually feels worth the money rather than some of the quick reads I see these days. Rating: Three and a half webs. Once again, America is trying to revamp its disastrously weak and expensive health care system. I wonder if they'll succeed, but judging from how often phrases like "socialized medicine" are being thrown about, I have my doubts. President Obama's plan is probably not perfect, and could certainly be fine-tuned and will cost money to get going, but really, the objections of most of the Republicans and others seems to be based on playing politics rather than principle. It's an Obama plan, so it's a bad idea. It's downright un-American to let the government pay for some of your sick care, darn it! Repeat the old arguments ad infinitum, and forget about the growing cracks in America's economy that can be directly traced to a collapsing health care system. All I know is that I've lived in America with its health care system and under New Zealand with its commie-loving red "socialised medicine," and I sure know which I prefer. Neither system is perfect, but in America, my family constantly had to prepare ourselves for how much basic medical care was going to run us. We had to set aside thousands of dollars just to have a baby, knowing the costs would exceed deductibles. Every single time I had a medical procedure - and I've had a few - you could guarantee it would spend months winding its way through a labyrinthine insurance maze, where each claim would randomly be approved or not depending on the mood of the insurer. Back in 1999, I had an emergency appendectomy. Bad scene, vomiting, dizziness, et cetera. At the doctor's office I was in a pretty bad state, and my friend Irwin was going to drive me 20 miles up the road to the hospital. But the doctors saw how bad I was and decided it would be better to get an ambulance ride (my first and only ambulance ride, and I was too out of it to enjoy!). Months later, my insurance told me they wouldn't cover the $400 ambulance ride, as it wasn't medically necessary. This despite the fact that the doctors at the clinic REFUSED to have someone drive me to the hospital. Should I have walked? The Orwellian inanity of that one simple claim sums up to me what's bankrupt, morally and financially, about US healthcare. By contrast, all the medical care we've had in New Zealand has been pretty great. Doctors' visits are nearly free (we pay a token sum at our doctor who's in the fancier part of Auckland, but he's unusual -- most GPs are basically free). I get referrals to hospitals for major care if needed; just today, I got an appointment for a hearing test with some problems I've been having with one ear. Won't cost me a cent. Now, sometimes you do have to wait a while for referrals and there are other flaws with the system, but still, I know which I like more. Our taxes are no higher than they were in the US with state/federal/Social Security and insurance payments, and I'd much rather pay taxes for sure government service rather than dob in for an insurance payment that may or may not result in coverage eventually depending on corporate whims. I wish Obama luck. I think trying to rush anything so big through in a few weeks is a bad idea, but he's fighting the good fight so far by not just letting the idea die like the Clintons did back in the 1990s. But the problem in America is that far too many powerful interests are opposed to reforming health care out of greed, or laziness, or simple partisan point-scoring, banal slogans winning over substantial debate any time. It's a shame, and one of the things that reminds me why I live overseas now. Why it's famous: Won Best Picture Oscar of 1967 against contenders like "Bonnie and Clyde" and "The Graduate." 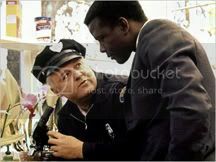 Starring the great Sidney Poitier and Oscar winner Rod Steiger. Takes on tough racial issues. What I thought: I'd been meaning to watch this for ages, especially after reading Mark Harris's superb book "Pictures at a Revolution: Five Movies and the Birth of the New Hollywood," which examines each of the five Best Picture nominees in this game-changing, transitional year for American film. It's a movie that can seem a tad hokey in 2009 -- black city cop helps solve a crime in backwards small town Mississippi, dealing with racists galore -- but all you have to do is remember how it really was a mere 30-40 years ago for black folks to know that Poitier's character's experience is no exaggeration. Poitier is wonderful as the tough talking "they call me MISTER Tibbs," adding a bit of necessary outrage to his typical near-saintly character repertoire. But Steiger is equally great in the harder role as the racist small town cop who starts to learn something about the wider world. Worth seeing if you haven't: Well, I do think "The Graduate" and "Bonnie and Clyde" are, in hindsight, far more important movies, but I can see why this won the Oscar in turbulent 1968 (just after the assassination of Martin Luther King, too). The biggest problem viewing the movie today is that it's a bit of a fixed time capsule of the way things were then, but it still holds up pretty well. I found the major flaw to be that I never really cared about the murder mystery that is the instigator of the movie's plot, though. It fails as a detective story but is a great character study. Why it's famous: Won Best Picture Oscar of 1973. "The Entertainer" jaunty piano tune that just won't get out of your head. Robert Redford and Paul Newman, together again and up to no good. What I thought: I was expecting a classic buddy comedy with bite a la Newman and Redford's "Butch Cassidy and the Sundance Kid," but have to admit, I was a bit let down by this one, finding it a bit cloying and artificial. 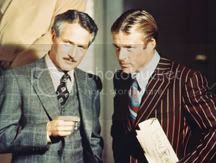 It's never a bad movie per se, but it seemed slight to watch Newman and Redford's grifter con Robert Shaw's gangster in the kind of hugely elaborate, over-the-top setup that movies of this nature seem to specialize in, and it all leads to an ending that's highly predictable. 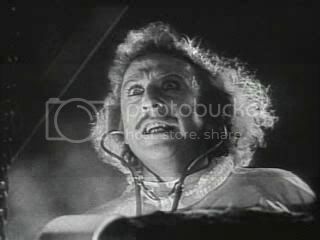 It's curious to watch a movie from 40 years ago that strives to be a homage to another era 40 years before that one -- it's kind of like a double negative, seeing movies from the '70s set in the 1930s, with the garish lighting and colours of the 1970s prevalent. But Redford and Newman are never less than charming, with Newman particularly solid, and they go a long way toward making the movie work. Perhaps I was just expecting something a bit more from it, but in the end it all seemed a bit too long and wrapped up in its own intricacies to mean much more than a con game gone supersized. Worth seeing if you haven't: Sure, but in the end you might feel a bit conned if you're not in the right mood. Why it's famous: News of the recent remake of this with John Travolta got me curious to see the original, a gritty 1974 action flick starring -- Walter Matthau?!? The prospect of hangdog Walter Matthau, action hero, piqued my interest. What I thought: There's something I love about almost any film set in New York City in the 1970s, dingy, sassy and multicultural (before there was such a word) and full of angry, shouting men. "Pelham" isn't any particularly deep movie but it's a very fun thriller about a subway train hijacking by a seedy bunch of criminals led by a great, sneering Robert Shaw (him again!). 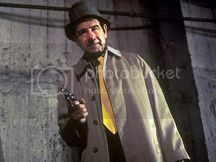 Matthau is the humble transit cop who gets wound up in the action. Matthau's character actually spends much of the movie just talking on a radio, but it works. A lean, mean ride - the characters basically have no interior life, and in its quasi-real time setting it's almost like a very special episode of TV's "24." Starring Walter Matthau as Jack Bauer, that is. Which would be totally awesome. Worth seeing if you haven't: Some folks don't like watching movies set in an era when everyone wore bell-bottoms, but fashion aside, "Pelham" is a great little roller-coaster ride. It might seem a tad sedate in an era of CGI explosions (I'm sure the remake amps up the action approximately 1000 percent), but I loved it. * No, no, Jeff Lynne, it's "all right," not "alright." This really bothers me. ** From XTC's ecstatic spaz-pop stage. 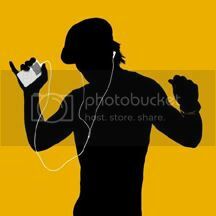 Music for spasming to! *** I maintain Phil Collins '80s work as a serious guilty pleasure. I'm not a big Eric Clapton fan, really, but his guitar solos in this tune are straight-up groovy. **** I love this tune, one of the best evocations of the Beatles era by one who lived through it. Gentle and appreciative nostalgia. ***** What the heck, is it Phil Collins Sunday on my iPod? This song, not quite as good as the "Easy Lover" era Phil - in fact, this is probably a good turning point where Phil started becoming overly mawkish and sentimental as a writer. It's not a terrible tune, but the early 1990s mark a demarcation between "fun" Phil and "serious social issues and lots of lame Disney soundtrack tunes" Phil. *****I don't think there's a better song title, anywhere, ever. I'm of two minds about Alex Ross. He's been probably one of the most-praised artists of the past 15 years or so in comics, with his distinct photo-referenced painterly style and undying reverence for the classic superheroes, on display in series like "Marvels," "Earth X," "Justice" and many more. 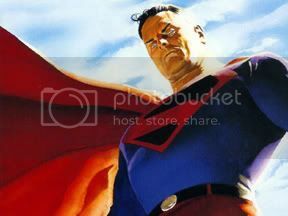 When Alex Ross paints Superman, you can see why they call him the Man of Steel -- all granite jaw and stern power, done with a photorealistic detail that often leaps out of the pages. Yet Ross's sheer talent and reverence also gives way to stiffness sometimes, and his affection for "revisiting" classic superheroes can start to seem a bit dead-end, endless nostalgia without much forward motion. I admire Ross tremendously as a technician – his coffee table art book "Mythology" is a gorgeous testament to his skill -- but I think as a storyteller, he's a bit hit or miss. The characters often pose rather than move with the fluidity of a Will Eisner or Frank Miller. To me, his work struggles to escape the frame of pin-ups. Lest I sound like I'm bagging on Ross, I think his peak remains his collaboration with writer Mark Waid, 1996's "Kingdom Come," an epic tale of heroism and failure in the future of the DC Universe, featuring Batman, Superman, Wonder Woman and their various protege and successors in a twisting and bombastic morality tale. Ross has a lively power to his artwork here – I don't think I've ever seen Bruce Wayne's face seem quite so spot-on for the character, handsome yet a bit devious and scarred. Ross's aging Superman has also rightly become an iconic presentation. Waid's script is among his best work, too, and he doesn't succumb to the weaknesses that have marred some of Ross's other collaborations. 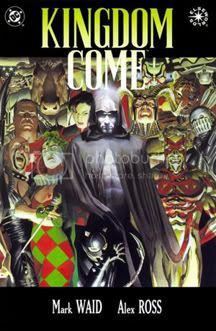 The whole "alternative dark future where lots of characters die" story trope has been done to death, but "Kingdom Come" succeeds because it touches some universal chords about what it means to be a hero. It nicely comments on the comic industry vogue for "grim 'n gritty" killers as heroes in the 1990s. There's a reason staid and steady Superman has remained in print for 70 years now, and Waid shows us what it is. Many of these big everything-and-the-kitchen-sink tales haven't worked for me because they're so overstuffed, but despite the acres of capes and cowls on display in "Kingdom Come," there's a quiet moral center at the core, nicely portrayed in the humble human preacher Norman McKay. I find myself moved when I re-read "Kingdom Come," something that doesn't happen in a lot of the other big superhero pile-ons. Of course, DC has gone on to milk "Kingdom" for all it's worth, using its speculative alternative future as a basis for endless changes and permutations in the "real" universe. But the original is still a hell of a read, and marks Alex Ross' apex as a creator I think. There's nothing better to do in the middle of winter than the New Zealand International Film Festival. More than 100 fine movies from all over the world are screening in Auckland, and poor old me only got to four of them -- but they were four terrific flicks, well worth seeking out. I do loves the film festivals! A more charmingly offbeat documentary you won't see all year. Back in 1990, a really, really bad movie called "Troll 2" was made. It's late-night marathon horror movie schlock that in its sheer awfulness (no really, it's not good) has since gone on to become a cult hit of "Rocky Horror" proportions, with fans reveling in the terrible acting, story and effects. Fans hold "Troll 2" parties and re-enactments. Now, former "Troll 2" child actor Michael Stephenson has gone on 20 years later to make a documentary about the "Troll 2" comeback story, looking at how the amateur actors see it now. But "Best Worst Movie" doesn't just mock "Troll 2," and instead turns an eye on the whole concept of trash becoming treasure, of something becoming the object of cult adoration. Best of all is George Hardy, the square-jawed fellow who played the lead role in "Troll 2" who has since gone on to be a small-town Alabama dentist. Hardy is a delight, an outgoing, charmingly sincere fellow who still has affection for his brief moment in the spotlight (he even tells patients about "Troll 2" during cleanings! ), and who sees in the "Troll 2" revival a last chance for fame. "Best Worst Movie" has a big open heart for eccentrics and oddballs and would-be stars, and is delightfully funny in the process without overly mocking anybody, even the pretentious Italian director of "Troll 2" who is vaguely offended how everyone is laughing at his movie, or the spaced-out actress who quite seriously compares "Troll 2" to "Casablanca." Like the best documentaries, "Best Worst Movie" takes you somewhere unexpected, and is well worth hunting out. Now I actually have to watch "Troll 2" sometime! Like a cross between "Borat" and "Heart of Darkness," this amazing documentary tells the tale of Slovenian icon Martin Strel, a big-bellied, beer-drinking, horseburger-eating man who, remarkably, is an ultramarathon swimmer who bas become the first man to swim the entire length of the world's longest rivers -- the Danube, the Mississippi, the Yangtze. Strel doesn't fit anyone's mental image of an extreme athlete, but he's the toast of Slovenia in the endearing prologue to this tale of his taking on the Amazon River – his longest record yet, more than 5000 kilometers of swimming in piranha and bacteria-infested waters. He does it all to draw attention to the world's environmental woes. "Big River Man" moves from a kind of yokel comedy into something deeper and stranger as Strel's Amazon epic gets underway. Sometimes, I felt like the directors got a bit too into stylistic tricks rather than focusing on the story in front of them. But the sheer chutzpah of the subject matter outweighs a few flaws. Was it worth the staggering cost for Strel in the end? I don't really know. But his feats are amazing and this guy's name should be known by people in the same breath as Michael Phelps and Mark Spitz, and "Big River Man" is a worthy tribute. Big River Man - Trailer from KNR Productions on Vimeo. Imagine commuting to the moon. In this stunning little movie, Sam Rockwell plays an engineer named Sam Bell who works on the moon, manning mining stations that now provide much of Earth's energy needs. He lives alone on a moon base, with a contract of three years, spending much of his time making models, exercising and trying to keep sane alone. Now, Bell is just two weeks away from the end of his contract and can't wait to get back to Earth. But something very strange starts happening around the base, and Bell begins to think he's going insane. "Moon" is clearly indebted to classic brainy science fiction like "2001" and "Solaris" (Kevin Spacey voices the station's helper computer system, which ought to be called 'Son of HAL. '), but it's an impeccably done experience. It's directed by none other than David Bowie's son, formerly Zowie, now known as Duncan Jones -- and I tell you, Jones is a director to watch. He stages "Moon" with a combination of beauty and menace, utilizing very subtle yet perfect special effects, and has utter control of the production. But the movie's biggest star is Sam Rockwell, who is basically on screen carrying the entire movie by himself. 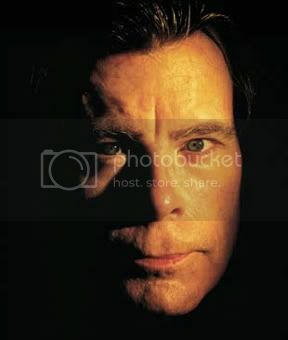 I love Rockwell, who's been great in movies such as "Confessions of a Dangerous Mind" and "Matchstick Men," and he's the best he's ever been in "Moon" -- funny, heartbreaking and intense. I can't give too much away about the nature of his performance witout spoiling the movie, but let's just say he really deserves an Oscar nomination for his turn here. Genuinely haunting and beautiful, "Moon" is just about the best movie I've seen in 2009 so far. It's playing at small theatres all over now so go hunt it out. In 1822, eight convicts in remote Tasmania escaped into the tangled bush. One walked out, and told a terrible tale of starvation and cannibalism. I recently re-read Robert Hughes' great history of convict Australia, "The Fatal Shore," and the episodes set in Tasmania -- then known as Van Diemen's Land -- rank as the most shocking of the sordid history of "transportation". It's inevitable that it would become a movie, and first time director Jonathan auf der Heide, a Tasmanian, does a fine job of exploring the story in a stark, lushly filmed drama with some stunning cinematography. You can see the influence of Terrence Malick in the filmmaking, which makes the endless green and grey forests of Tasmania seem quite foreboding and evil. The landscape plays a crucial part in the unfolding drama. There's a matter-of-fact approach to the violence that generally avoids horror movie shocks, which makes it all the more awful, and a nice brooding near-silent performance by the central convict Pearce (Oscar Redding). It also makes for a rather pitch-dark, harrowing movie, with a darkness that feels kind of grueling by the end, and sometimes "Van Diemen's Land" moves too slowly, with a few too many lingering tracking shots. But it's generally a gripping first feature, skirting the line between existential drama and horror movie. I tell you one thing -- I'm glad I'm not a convict in 19th century Australia. But then that goes without saying. I know, I'm like a year behind the cool people, but hey, I finally got around to picking up MGMT's hipster-tastic album "Oracular Spectacular" the other day and am really digging it, especially the bouncily joyful "Kids," which has a particularly swell fan-created video here (it's actually better than the real band video). I am it sharing with you in my self-proclaimed mission to revive the joys of the music vid in pop culture. Have a swell weekend! • Marvel at the wooden iPod! I'd love one of these made of NZ kauri. Whenever I'm asked about my favorite writers, the answers are different depending on what day it is. But there are constants, and usually, my favorite writers would have to include George Orwell, the late John Updike and Kurt Vonnegut, Haruki Murakami, Paul Auster, and... Stephen King. That last one doesn't always seem to fit to everyone when I say his name. Unfairly, King has somehow been lumped in with the Wal-Marts and Starbucks as ubiquitous shorthand for American junk culture. I think King surely gets the short shrift as a writer; he isn't a literary gamesman like Auster or Updike, which he would gamely admit, but he is one heck of a storyteller. King's books to me have always brought to mind cheeseburgers -- nothing rare, nothing fancy, but done right it can be the perfect meal. He knows his strengths, and can tell a heck of a yarn to while away the hours with. How do you show leadership potential and your suitability for the presidency in 2012? Well, by quitting in the middle of your term, for no apparent reason. The Sarah Palin roadshow -- you can't make this stuff up anymore. Reminds me a bit of John McCain "suspending" his campaign to deal with the economic crisis, because politicians surely can't be expected to deal with more than one thing at once. Big gestures, empty substance. I found it hard to believe I'd find a politician more loathsome than Bush Jr, but wow, Palin's naked cynicism and pandering knows no bounds, does it? One would hope she does run against Obama, just to see him wipe the floor with her. Every time I think the current state of the Republican Party in the US can't get any more comical, they manage to top themselves. The Dems are hardly perfect, but honestly -- it's just getting absurd on the red team. Happy Fourth of July, all y'all.